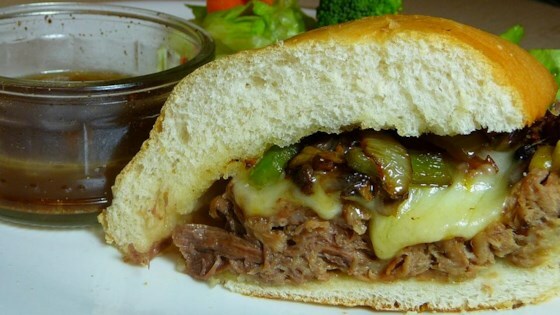 "Using a slow cooker to cook the meat to just-right tenderness, you too can serve a true French Dip to all of your friends and family during the cold winter nights! C'est si bon!" Remove and discard all visible fat from the roast. Place trimmed roast in a slow cooker. In a medium bowl, combine soy sauce, bouillon, bay leaf, peppercorns, rosemary, thyme, and garlic powder. Pour mixture over roast, and add enough water to almost cover roast. Cover, and cook on Low heat for 10 to 12 hours, or until meat is very tender. This recipe is a crowd-pleaser, and your slow cooker does the hard work.